This is the second of three excerpts adapted from the new book "Empty Mansions: The Mysterious Life of Huguette Clark and the Spending of a Great American Fortune," by NBC News investigative reporter Bill Dedman and Paul Clark Newell Jr. The Estate of Huguette M. Clark, from "Empty Mansions"
How tantalizing this eccentric patient was for the leaders of a nonprofit hospital dependent on fundraising. Here was a woman, well into her 90s, with something more than $300 million, and she was living in their hospital. 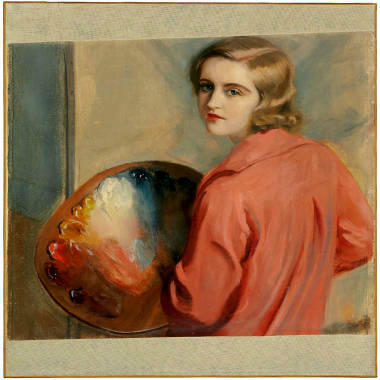 Huguette Clark was the girl who could spin straw into gold. From age 85 to well past 100, when most people need elaborate pillboxes marked with the days of the week, Huguette was remarkably healthy, requiring no daily medications other than vitamins. Yet she stayed in the hospital for a bit more than 20 years, for 7,364 nights, though she said she couldn't stand the hospital food. Why? She said she felt safe there. When one of her round-the-clock private nurses kept urging her to move back home, Huguette fired her. On New York's Upper East Side at Doctors Hospital, which became part of Beth Israel Medical Center, the hospital's doctors and managers could have discharged her after her skin cancer was cured. But repeatedly they came back to her for larger and larger donations. A month into her stay, her internist, Dr. Henry Singman, alerted the brass that his patient "was quite wealthy, the scion of a multimillionaire copper industrialist." When the doctor told Huguette that it was costing him $20,000 to paint his house, a few days later she gave him a check for $20,000. When he broke his hip on a trip to Italy and needed an air ambulance, Huguette gave him $65,000. In all, Singman and his family received $867,951 in gifts over 20 years. Her surgeon, Dr. Jack Rudick, and his wife received more: nearly $1.17 million in gifts, and the doctor borrowed another $1 million. After he made no payments, Huguette eventually forgave the loan. When Huguette's attorney and accountant complained, Rudick said it had been intended as a gift all along. 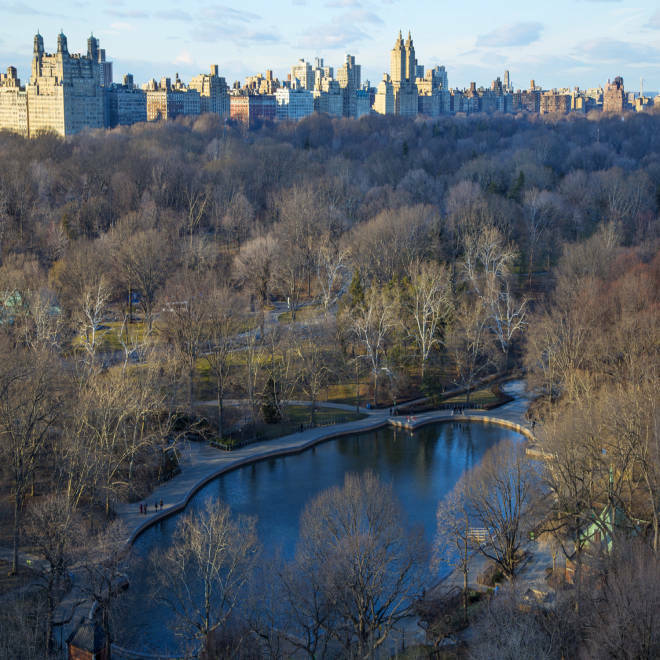 © John Makely, collection of Bill Dedman, from the book "Empty Mansions"
This is the view that Huguette abandoned, the view from atop her apartment building at 907 Fifth Avenue, with a vista of Central Park including the sailboat pond in the foreground. © Bill Dedman, from the book "Empty Mansions"
This is the view from Huguette Clark's last regular hospital room at Beth Israel Medical Center in New York City. 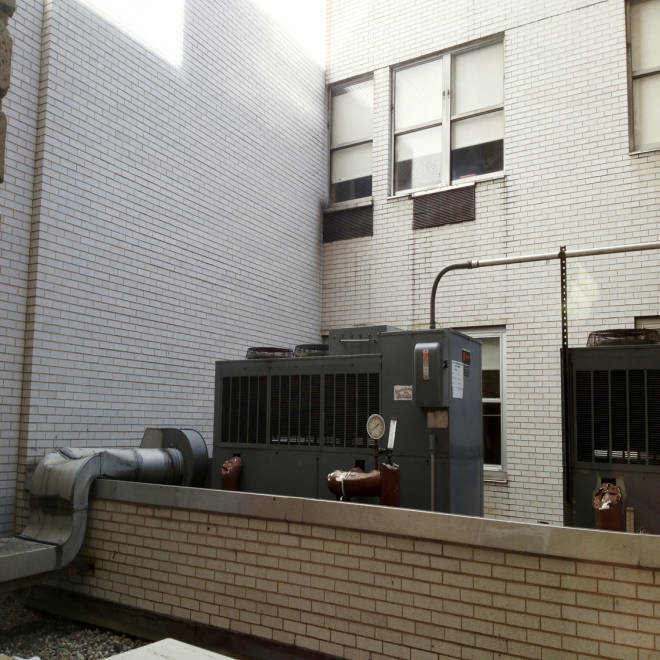 From her window in room 3K01, one can see no sky at all, only the facing wall of another wing of the hospital, and the air conditioning units. Huguette spent her last 7,364 nights in hospitals. The biggest opportunity for the hospital came in early 2004, when a developer wanted to tear down the Doctors Hospital building and put up a high-end apartment building. The hospital CEO, Dr. Robert Newman, suggested to the chairman, shipbuilder Morton Hyman, that they use this opportunity to get a "supermega gift" from Huguette. On May 11, 2004, they visited Huguette. Dr. Newman wrote a note documenting the visit. He told Huguette that Beth Israel was almost sure to sell the building and that offers were in hand. Beth Israel would have to sell the hospital, and the patients would have to move. Huguette asked to see a copy of the hospital's financial statement. And she said she didn't want to move. There was one way she wouldn't have to move, Hyman told Huguette. "A contribution in the neighborhood of $125 million would obviate the need to sell." Her choices were clear: If she did nothing, she would have to move. If she gave the hospital $125 million, she could stay. Her reply: "That's a lot of money." And she asked for a copy of the hospital's financial statements. This was a shakedown. On the street, such a payment is called protection money. In nonprofit hospital management, it's called major donor development. The hospital attorney, Marvin Wexler, said it acted in her best interests. Indeed, Huguette thrived at the hospital much more than she had alone in her 42-room apartments. "The indisputable reality is that Beth Israel rescued Mrs. Clark from a secluded and extremely unhealthy existence that endangered her life," Wexler said, "and then provided her a well-attended home where she was able to live out her days in security, relative good health and comfort, and with the pleasures of human company." Huguette could have afforded to buy the building. She had more than $150 million in stocks, bonds, paintings, jewelry, and cash, in addition to more than $150 million in real estate. But she withstood the pressure. She had her father's caution, and stubbornness. The shakedown failed. As desperately as she wanted to stay in the hospital, in that very room, she agreed to move downtown to the main Beth Israel campus. Indeed, Huguette’s last donation to Beth Israel was in 2002, not counting money she left in her will. For the last nine years of her life, she repeatedly said no to its implorations. The hospital had received her Manet painting, which the hospital sold for $3.5 million including commission. But in her will, the hospital received only a paltry $1 million. Beth Israel’s leaders had tried their best to exert their influence on Huguette, but W. A.Clark's daughter stood firm. It was October 25, 2005, six months after Huguette signed her last will and testament. On this Tuesday morning, notes in her medical chart showed her to be in an "acute confusional state" — delirious, agitated. She was hearing piano music. A stroke was possible. Her doctor called for a specialist. Dr. Louise Klebanoff had heard of the "little old lady who lived in the hospital." Now she was finally meeting her. The neurologist nudged 99-year-old Huguette awake from her morning nap. The patient opened her blue-steel eyes, seeing an unfamiliar face. "Leave me alone," Huguette said irritably in her high French accent, and closed her eyes. The doctor studied the chart and looked closely at the white-haired woman. Weighing barely 85 pounds, she was dressed in a housecoat and three white cashmere sweaters, and she had surprisingly soft, girlish skin and rosy cheeks. Skilled at cajoling older patients, Dr. Klebanoff gently persuaded Huguette to wake up and to play along with her mental status exam. She tickled her to test her sensory reactions. She gave her simple commands: Close your eyes. Hold up your arms. Wiggle your fingers. Huguette complied, and the doctor moved up to more complex commands. Clap your hands three times and stick out your tongue. "Leave me alone!" Huguette shouted, pulling the covers over her head. This turtle wasn’t coming out of her shell. Dr. Klebanoff said she’d come back tomorrow. The next morning, Huguette brightened up immediately when she recognized the smiling doctor. She sat up in bed and stepped through the tests with ease. She knew who she was and where she was and when it was. Huguette was very hard of hearing, but she was attentive. Her speech was clear, her reflexes quick. Her lab results and chest X-ray were clean. She was normal in every way, neurologically. "She seemed cute as pie," Dr. Klebanoff said later, "perfectly content." Huguette just had a cold, the doctor wrote on the chart, and was dehydrated, causing a temporary electrolyte imbalance, which can bring on confusion or hallucinations. With her fluids back to normal, she was fine. The women talked for another 20 minutes. Huguette gave the doctor a tour of her tabletop model castles from Japan with their brocade fabric interiors. She took out her photo album. Huguette showed the doctor her California house, a palace on a cliff by the Pacific, and her father’s house, the largest in New York City, with a tower and 121 rooms, including one adorned with gold. Taking all this in, the neurologist wasn’t exactly sure how much to credit this tale of gold and copper, kings and castles. What did it indicate about the patient’s neurological status? Dr. Klebanoff turned to the nurse, Hadassah Peri, and asked in a stage whisper: Is any of this stuff true? Oh yes, Hadassah said. It’s all true. Tomorrow: Part three, Hadassah and Madame. Learn more about "Empty Mansions." Previous excerpts and all of the NBC News stories on Huguette Clark are at http://nbcnews.com/clark/. The trial over Clark's $300 million fortune is scheduled to begin Tuesday, Sept. 17. Co-author Paul Newell, a cousin of Huguette Clark, is not involved in the legal contest.